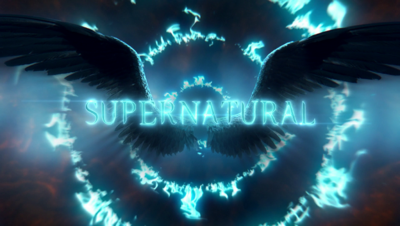 Title card for season fourteen. 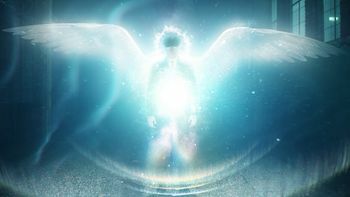 Angel wings are/were the primary mode of transport for angels, allowing them teleport anywhere on Earth, Heaven, or Hell. An angel's wings cannot be perceived by human eyes, however a silhouette of the wings can be seen if an angel chooses to reveal its power. 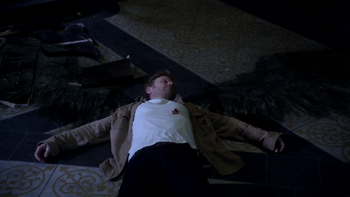 When an angel is killed, their body and wings will leave scorch marks on their surroundings. 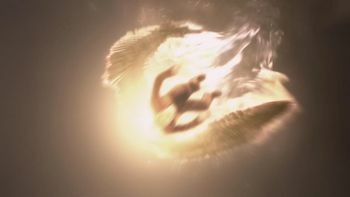 After the angels were ejected from Heaven by Metatron, the wings on angels were either burned completely off in the Fall or were left as mangled vestigial limbs, preventing the angels from teleporting. 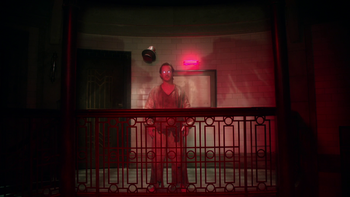 The only angels unaffected by Metatron's spell were Michael and Lucifer, who were both locked away deep in Hell in the Cage, and Metatron. 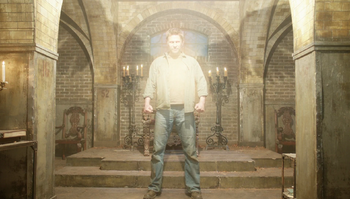 Gabriel also appeared to be unaffected by Metatron's spell during his imprisonment by Asmodeus. 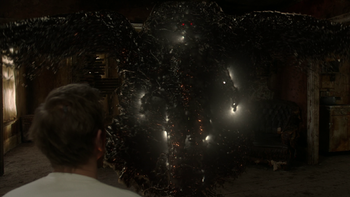 Angel feathers also hold special properties, specifically being a key component to the time traveling spell first used by Henry Winchester in 8.12 As Time Goes By. A single feather also holds rejuvenating properties for an angel, as shown by Lucifer, who used a fossilized feather to temporarily heal his deteriorating vessel, Vince Vincente. 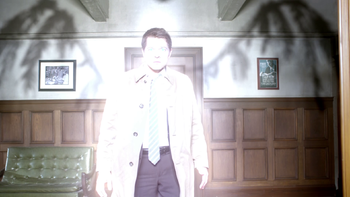 Castiel reveals himself as an angel of the Lord to Dean Winchester. 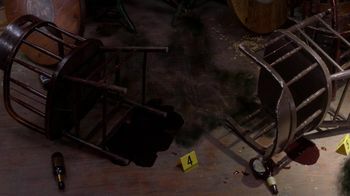 An unknown angel lies dead in the street with its wings scorched into the pavement and Uriel lies dead after being killed by Anna. 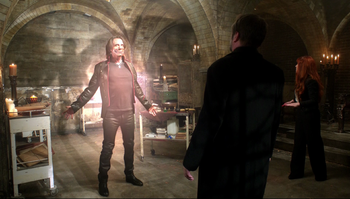 Raphael manifests his wings as electrical bolts after being called to Earth by Castiel. 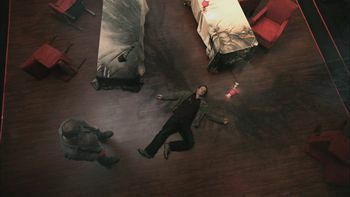 Zachariah lies dead in the Green Room after being stabbed in the head by Dean. 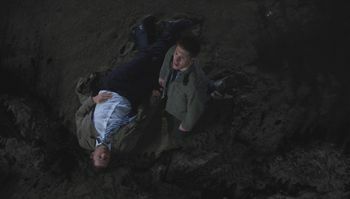 Gabriel's "death" at the hands of Lucifer. 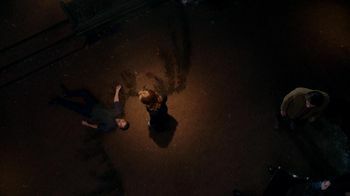 Rachel is killed after confronting Castiel. 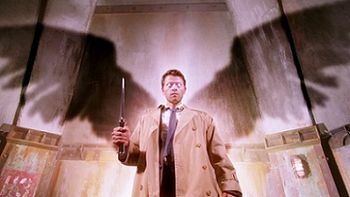 Castiel slaughters Raphael's loyalists in Heaven after attaining the souls from Purgatory. 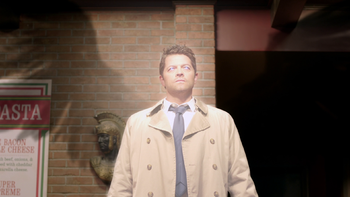 Castiel prepares to face Crowley for the demon tablet. 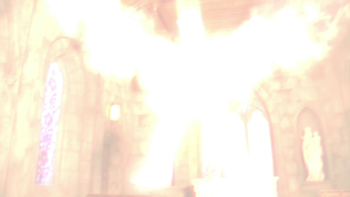 An angel's wings burn off as it is ejected from Heaven. 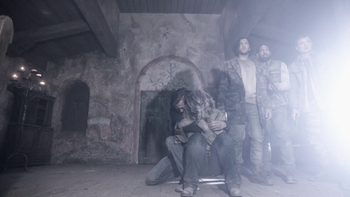 Gadreel revealing his damaged wings to a group of demons. Scorch marks left by a dead biker angel. 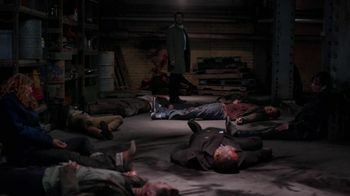 Castiel walks into the aftermath of an angel slaughter at the hands of Gadreel. 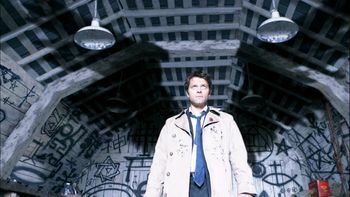 Castiel regains his grace, however his wings remain broken like the other angels. 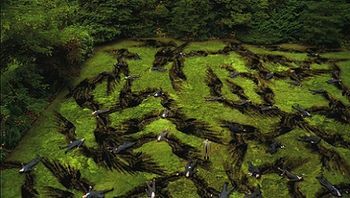 Benjamin and Ishim's wings scorched into their surroundings after their deaths. 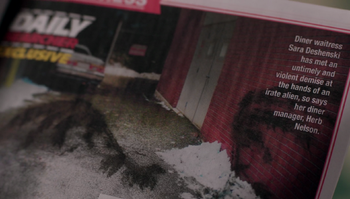 Castiel finds a newspaper article depicting the aftermath of an angel death. 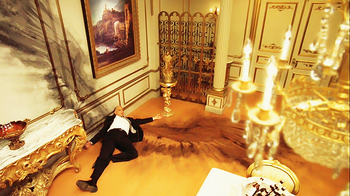 Lucifer shows off his power before attempting to kill Crowley. 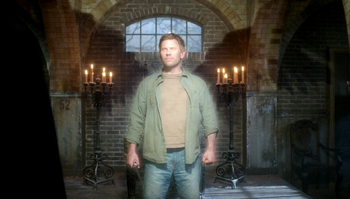 Lucifer prepares to kill Crowley by showing his wings. 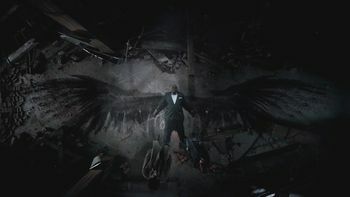 Castiel after he is killed by Lucifer with his broken wings scorched into the sand. 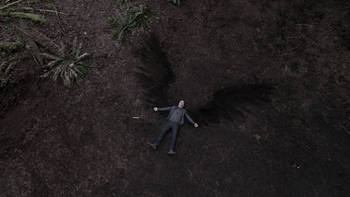 Castiel's wings scorched into the sand. 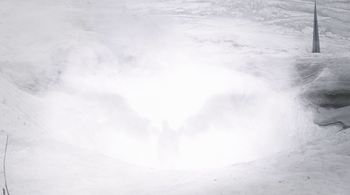 After killing a bunch of angels, Lucifer is confronted by the Apocalypse World version of Michael, who emerges from a crater giving off angelic white light, which shows his silhouetted wings. 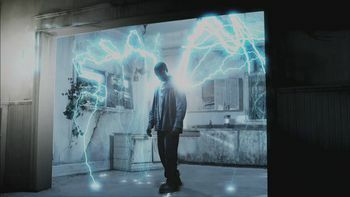 In a display of power, Jack's energy causes the lights to explode around him, giving him the appearance of wings before he teleports away. A contingent of angels is killed when the combined powers of Jack and Kaia Nieves send out a blast of energy. 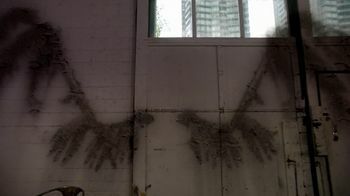 This disintegrates the angels, leaving their wings scorched on the walls behind them. 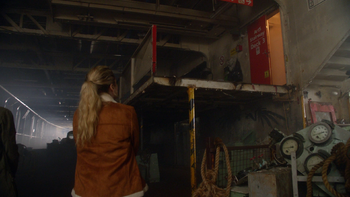 As Donna and Jody enter the abandoned ship where Sam and Dean were last seen, they take notice of the scorched angel wings on the walls. 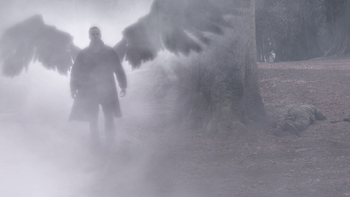 While facing down Asmodeus, who taunts him and calls him weak, Gabriel heals his own wounds and unleashes his wings before incinerating the Prince of Hell. 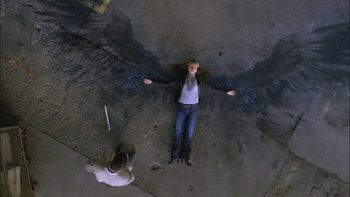 As Kevin Tran is about to attack by activating a magical sigil carved on his body, Jack uses his wings to cover and protect himself and Mary Winchester. 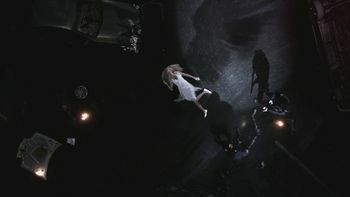 Michael appears with his wings spread after dive bombing near the rift. 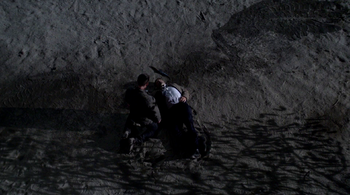 Gabriel lies dead with his wings scorched into the earth after his fight with Michael. 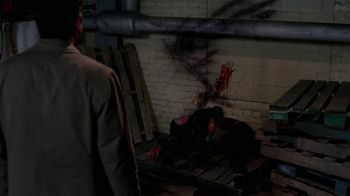 After consenting to be Michael's vessel, Dean shows Michael's wings before confronting Lucifer. 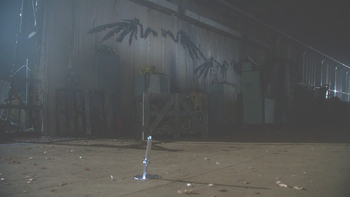 When Lucifer is fatally stabbed with an archangel blade, his wings explode in fiery light before they are scorched onto the floor of the church. 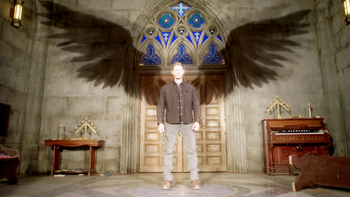 Sister Jo is able to recognize Apocalypse World Michael with his wings spread and energy flowing around Dean Winchester's body. 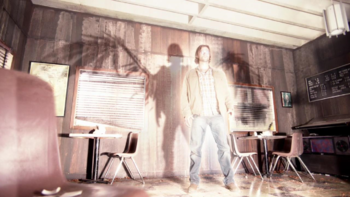 In the alternate timeline created by the disappearance of John Winchester in 2003, the alternate Castiel menacingly displays his wings. 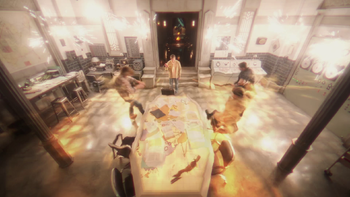 The light show draws the attention of the nearby Sam and Dean, who quickly rush to investigate. 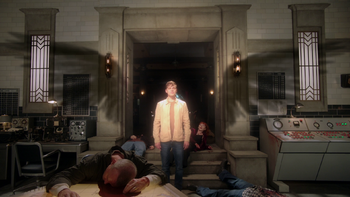 After killing Michael and consuming his grace, Jack tells Sam, Dean, Castiel, and Rowena that he is himself again as an intense light fills the Bunker library, revealing Jack's wings. Once released from the Empty, Lucifer unfurls his Empty-encased wings. 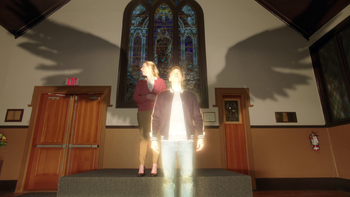 Jack appears before a bible group asking if they want to come with him and become angels, showing them his wings before taking them.